Environmental documents published by the Los Angeles Department City Planning offers up details about a new Hollywood hotel planned by local developer Five Chairs. Steinberg Architects has designed the mid-rise structure with a grid-like window pattern and a facade of metal panels. 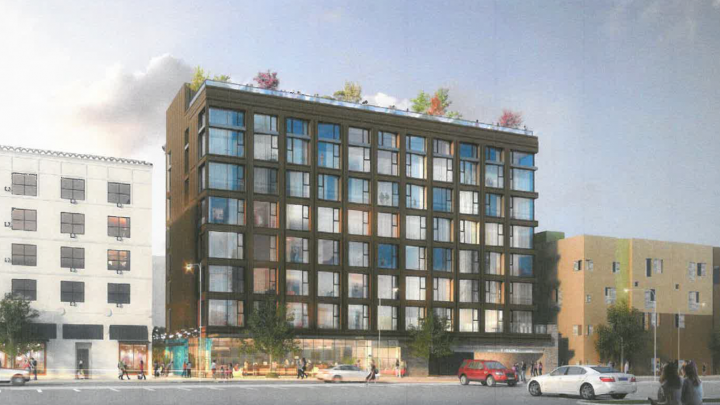 A ground-level paseo along the eastern side of the building would both provide separation from the adjacent Mama Shelter hotel and access to an internal courtyard. Construction of the mixed-use development would occur over approximately 23 months. An initial study identifies a groundbreaking date in the first quarter of 2017, and a completion date by the fourth quarter of 2018. Five Chairs, through its parent company Hollywood International Regional Center, is behind a number of hotel proposals throughout neighborhood, including the recently-finished Dream Hollywood and the delayed Thompson Hotel along Wilcox Avenue. The company had previously attempted to develop a Tommie Hotel a short distance south on Cahuenga Boulevard. Tommie is billed as a micro-lifestyle hotel brand operated by Two Roads Hospitality.